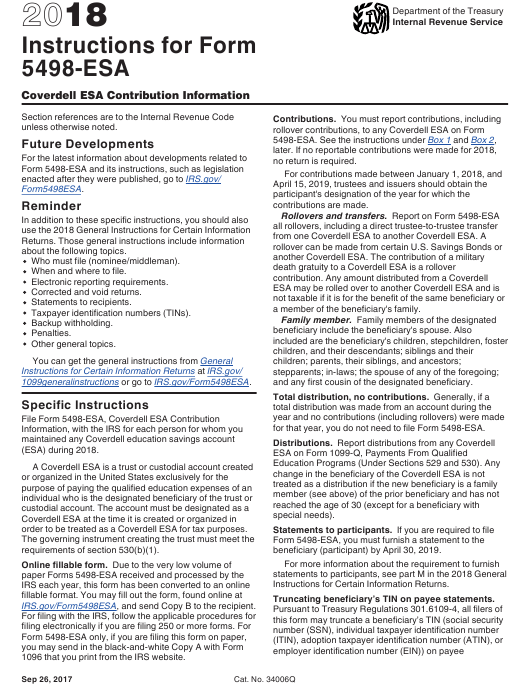 January 1, 2018 "Instructions For Form 5498-esa - Coverdell Esa Contribution Information" contain the updated filing procedures for the IRS-issued Form 5498-ESA. Download your copy of the instructions by clicking the link below. IRS Form 5498-ESA is a tax form issued by the United States Internal Revenue Service. A up-to-date fillable 5498-ESA Form is available for download through this link. a member of the beneficiary's family. and any first cousin of the designated beneficiary. for that year, you do not need to file Form 5498-ESA. order to be treated as a Coverdell ESA for tax purposes. beneficiary (participant) by April 30, 2019. Instructions for Certain Information Returns. Truncating beneficiary’s TIN on payee statements. IRS.gov/Form5498ESA, and send Copy B to the recipient. 1096 that you print from the IRS website. General Instructions for Certain Information Returns.